Do Men Have It Easier? Your Politics Might Determine How You Answer Democrats were more than twice as likely as Republicans to say that the country hasn't gone far enough in achieving gender equality, according to a new survey from Pew. A survey by the Pew Research Center finds Republicans and Democrats are divided on whether the country has gone far enough in giving women equal rights. Americans are divided along political lines — and by categories such as gender, age and education — on whether they think men have it easier than women today. A new report by the Pew Research Center looks at views of changing gender roles in the United States among 4,573 adults interviewed in August and September. There is broad consensus across most demographic groups about the principle that women deserve to have equal rights with men, said Kim Parker, Pew's director of social trends research. "Everybody agrees about that, but the country is really divided over how much work remains to be done," Parker said. "Some people think we're already there, and others think we still have a long way to go." 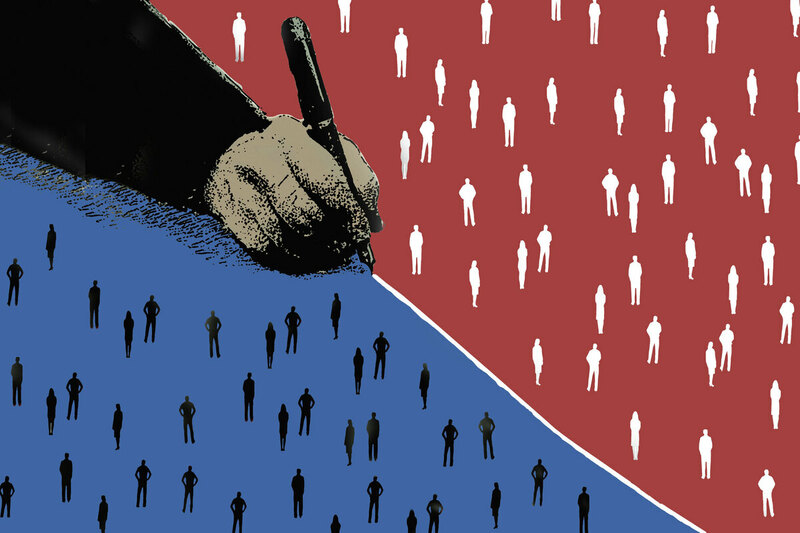 One of the biggest divides is along political party lines. Democrats in the survey were more than twice as likely as Republicans to say that women lag behind men in achieving gender equality; 69 percent of Democrats said the country "hasn't gone far enough" in giving women equal rights, while 26 percent of Republicans said so. Nearly half of Democrats (49 percent) said men have it easier these days. Among Republicans, most (68 percent) said there is no difference based on gender. "It's just another example of how deeply divided the country is along party lines," Parker said. The survey looked at multiple measures of whether changing gender roles are beneficial to society: whether they're making marriages more successful, helping men and women lead more satisfying lives, aiding families in raising children and earning a comfortable living, and allowing women and men to be successful at work. In each case, Republicans had a less favorable view than Democrats did of the shift toward more women working outside the home and more men taking an active role in child care and household responsibilities. Some of the findings appear to echo a survey released in early 2017 by the polling firm PerryUndem that found that Republican men believe it's a better time to be a woman than a man. The responses to the Pew Survey were also split along gender and generational lines, with women more likely to say that men have advantages. Overall, few respondents — about 1 in 10 — believed that women have easier lives than men today. More than a third said men have it easier. A small majority, 56 percent, said men and women have it about the same. "So on balance, more people think that men have easier lives than women," Parker said. Compared with older groups, millennials (defined for this survey as ages 18 to 36) were more likely than older groups to perceive men as enjoying advantages over women. While 37 percent of Generation Xers and baby boomers and 31 percent of the silent generation (ages 72 to 89) thought men have it easier, more than half of millennials said they do. Millennial women, Parker noted, "inherited a workplace that's much different from their mothers' and their grandmothers' generations" in terms of opportunities and wages, "but they're just as likely as the older generations to say that the country hasn't gone far enough in giving women equal rights with men." There is a gender divide in how millennials perceive the growing number of women in the workforce and an increasing role for men in the domestic sphere: 61 percent of men in that age group said women have benefited from these changing roles, while 48 percent of millennial women said they have. The report notes that there is no similar gender gap on that issue among other generations who responded to the survey. Parker said other surveys have found that millennial women are close to catching up to their male peers in closing the wage gap, but "when they look ahead in their careers, they see real roadblocks in their way; they don't anticipate an easy road ahead." People with more education had a more favorable view of changing gender roles and were more likely to say that additional progress is needed. That gap was more significant among Democratic-leaning respondents than among those who leaned Republican; 81 percent of Democrats who had completed a four-year college degree felt that the country hasn't gone far enough in giving women equal rights, while 55 percent of Democrats with a high school education or less believed that. Among Republicans, the number who said society hasn't gone far enough was around 1 in 4, regardless of education level. Women, at 43 percent, were also more likely than men, at 18 percent, to report gender discrimination in hiring, pay and promotion. The report notes that while gender gaps continue to exist in areas like wages and workforce participation, those gaps are narrowing. While female labor force participation has risen since the 1950s, male participation has declined; even so, men still outnumber women in the workforce by a rate of 69 percent to 57 percent. An earlier version of this story cited a portion of the Pew report that attributed generational differences between millennials and older groups to each generation's political leanings. Pew corrected its report to say it no longer believes those political leanings drive the overall generational gap.